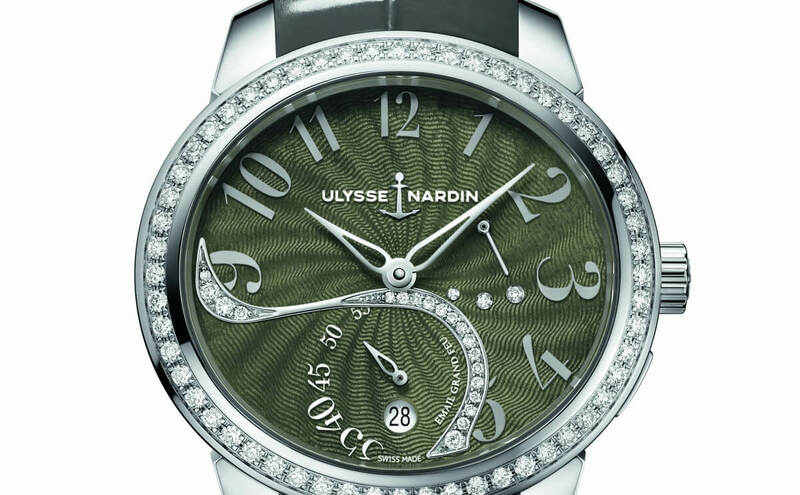 Ulysse Nardin Jade "Grand Feu"
The eternal femininity of Ulysse Nardin Jade is celebrated by 3 editions with handcrafted enamel dials. The exquisite elegance of Jade attains a new level of decorative beauty with the addition of rare enameling technique. On the dial of the three new Jade "Grand Feu" editions, set with 22 diamonds, enamel works its seductive magic. Complex and difficult to achieve, the decorative art of "Grand Feu" enamel is seen on only a handful of timepieces by the world's most prestigious watchmakers. Here on the Jade "Grand Feu", the turquoise enamel meets the swirl of diamonds across the face and on the stainless steel bezel (set with 56 diamonds). The stylized indexes are easy to read, revealing Jade's practical nature. A small date window is surrounded by the sinuous curve of diamonds on the continuous seconds feature, while three diamond drops are part of the crown position indicator. When it was first introduced in 2013 Jade represented several firsts in Haute Horlogerie. 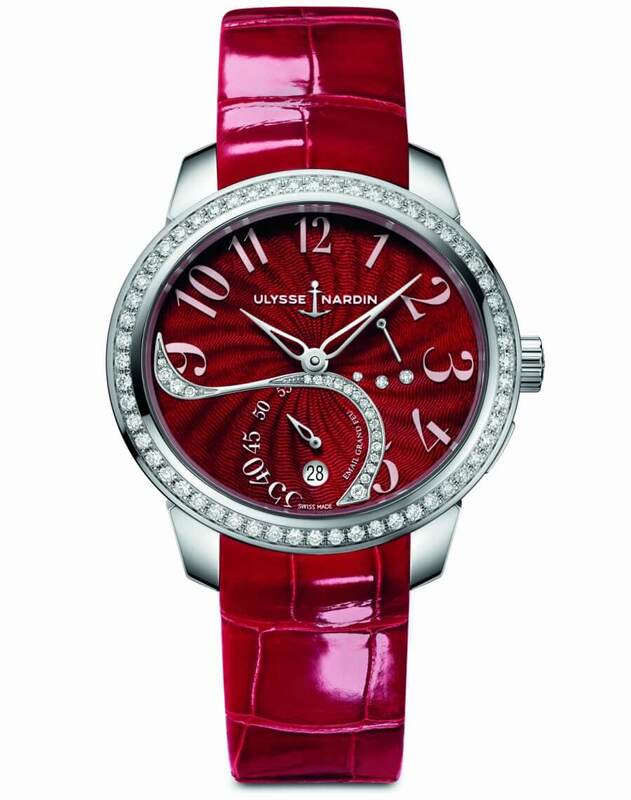 Its UN-310 caliber was the first movement to be designed and produced in-house by Ulysse Nardin specifically for a woman's watch. 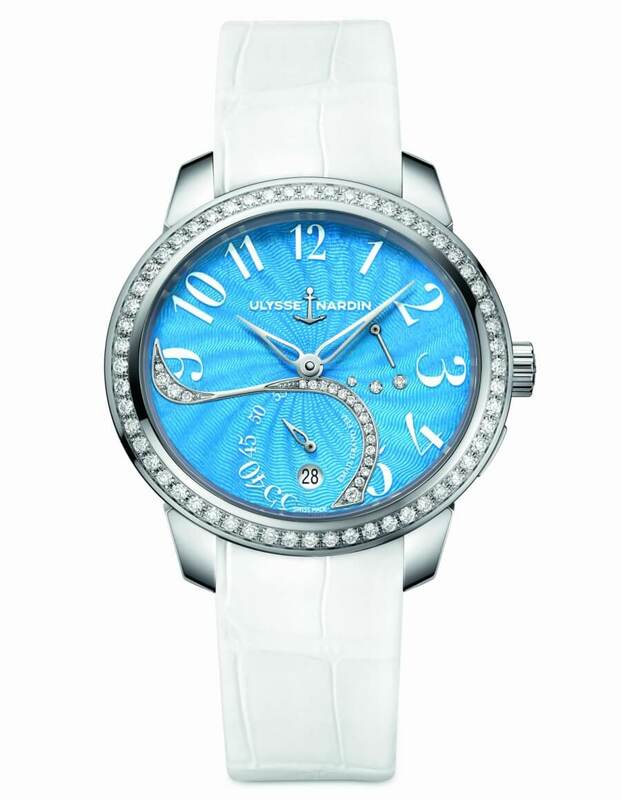 And it was the first timepiece to take into account a woman's delicate manicure when manipulating the settings. How? With its innovative crown design: no pulling is required to wind the watch, set the time, or adjust the date backwards or forwards, only a simple turn. A dainty crown position indicator on the dial shows the wearer which setting she is adjusting. As already pointed out the movement if a UN-310 caliber with escapement in silicium provided with 41 jewels. It offers a power reserve of about 48, being a mechanical self-winding timepiece. The case is 36 mm x 39 mm stainless steel. The case-back is sapphire crystal. Two more Jade "Grand Feu" editions, in red ruby and mysterious grey, with matching leather straps, complement the highlighted Jade in turquoise enamel with its white strap. They display all the craftsmanship of the Donze Cadrans enamel specialists. While it appears wonderfully decorative, Jade has a deeply practical side, as its crown design attests. Its movement incorporates Silicium components for enhanced precision and durability. It boasts anti-reflective sapphire crystal and case back and a water resistance to 30 meters.